I love the idea of fragrance, that a scent can evoke memory and that just a few notes can represent how want to express yourself to the world. In a lot of ways, fragrance has the same ability to be a form of self-expression in the same ways fashion does, albeit in a far more subtle and nuanced way. Even though I’ve always loved the idea of fragrance, I haven’t always worn in on a daily basis. This is for two main reasons, 1. When I was younger, most perfumes being released erred on the side of fruity and floral and girly, scents which I’m genuinely not enticed by or drawn to and 2. Perfume is a lot like jewelry for me, in that I love it, but it’s usually out of sight and out of mind for me when I’m getting ready and I simply forget to wear it. I’ve recently been getting more and more into wearing perfume on a daily basis. It's become a very simple and quick act of self-care that lifts my mood for the rest of the day. Sali Hughes once mentioned in one of her videos about perfume that smelling one's perfume throughout the day is cheering and I 100% agree. So in the spirit of becoming more and more of a perfume person I thought I'd share my favorite fragrances of the moment. One of my longest standing fragrances in my collection is the much loved Jo Malone Wood Sage & Sea Salt. It's a scent that I can wear no matter my mood or the season. I tend to prefer more masculine scents and this one strikes the perfect balance of being woody and masculine, while still smelling fresh and somewhat feminine. I will say that this fragrance doesn't have super long staying power since it is just a cologne, but since it comes in such a small bottle it's easy to transport for top ups throughout the day. I don't love all of the Jo Malone perfumes since I find some of them to be a little too floral to my liking but the English Oak & Red Current has definitely become a fast favorite. Because I bought it over the holidays, the scent tends to remind me of Christmas. The main notes are red current (obviously), rose, mandarin, musk, and oak. This is definitely a heavier perfume, but it still has a lightness to it that makes it appropriate for daytime wear. This also smells incredible when mixed with Wood Sage & Sea Salt. Glossier You was not a fragrance I immediately loved. I will admit that I bought it out of sheer love for the brand. I'm normally not one to buy perfumes without having smelled them first, however because I trust Glossier and it came at a pretty low price, I was willing to try it blind. I will say that this perfume is incredibly hard to describe. It's definitely on the sweeter side at first, something I'm not usually drawn to, but once it dries down you get the creamier, muskier notes coming through. Glossier You has become one of my everyday perfumes for when I'm feeling like something a little bit more feminine and subtle. I don't think I could write a post about perfume without mentioning Le Labo. Now unlike Glossier, there's no way I would ever purchase a Le Labo perfume without a thorough trial run, since the smallest bottles cost a hefty $180 a piece. I'm not even fully ready to commit to one quite yet. However, one of the really great things about Le Labo is they understand that their fragrances are investments and should be treated as such. Because of that they offer discovery sets and a really generous sample program, wherein you can buy a set of deluxe samples of any perfume you want for about $5 per sample. I know on the surface that sounds like a lot for a perfume sample, but because the perfumes are such good quality you need the tiniest spritz to get you through the day. I opted for the classic discovery kit, which includes their most famous and well-loved perfumes. My favorite from the set have been Thé Noir 29 and Bergamont 22, which are two very different perfumes. I like to think of Thé Noir 29 as Santal 33's underrated cousin. It has a lot of the same musky and woodsy notes as Santal, but is not nearly as recognizable as Santal has become (mainly because everyone and their mother wears it now). Bergamont 22 errs more on the fresher side of things, with its citrusy notes, but still manages to have a bit of musk to keep things somewhat masculine. I am absolutely obsessed with candles. I am not however, obsessed with the price of most nice candles. Don't get me wrong, smelling a Byredo, Jo Malone, or Diptyque candle can most aptly be described as ascending into heaven, but I have a near impossible time justifying the $70-ish price tags. Luckily there has been a surge of affordable (they aren't super cheap but significantly less than $70) candles on the market that not only burn incredibly well, but also have really complex and sophisticated scents that are very reminiscent of the higher-end candle options. 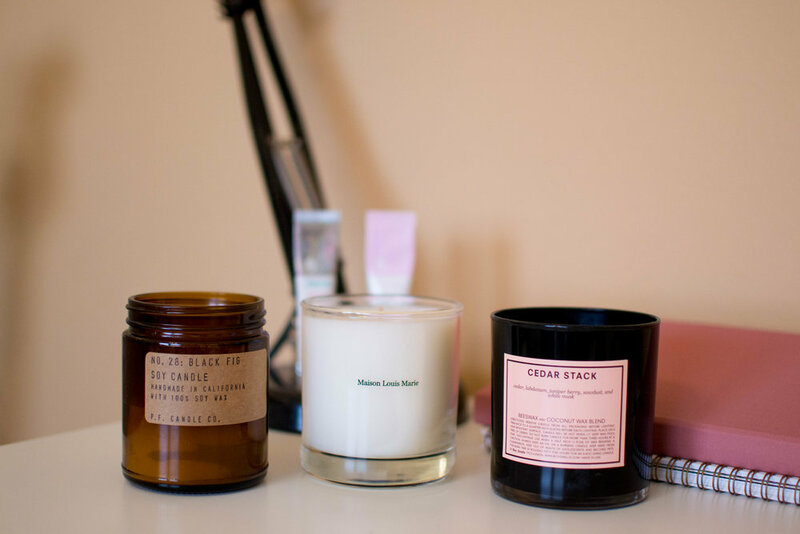 Its worth noting that all of these brands of candles have a solid range of scents and while I am recommending specific scents, its worth giving the other scents in these ranges a whiff. One of the longest standing companies in my candle rotation is P.F. Candle Co. These candles range from $18-24 depending on where you buy them. One of the best fragrances in the range is Black Fig, which I think can be burned both in the warmer and cooler months because it has the fruitiness that you want when its warmer and the spicy and woodsy notes you want when its cooler. These candles also have a total burn time of 40-50 hours, which makes it a great value per ounce. If there's one candle that is incredible just from a aesthetics perspective its got to be Boy Smells Cedar Stack. All of the Boy Smells candles come in the most amazing millennial pink boxes and are housed in a black glass jar with a pink label. Looks aside though, the fragrances themselves are incredible. Cedar Stack in particular is my favorite scent in the range because it has a really woodsy but fresh scent. I think the best way to describe it would be a sophisticated Christmas smell, because it has those woodsy aspects of a typical "Christmas" candle, without being over powering or generic smelling. Boy Smells candles are priced at a fairly reasonable $29 for a 8.8 oz. (which is the same size as a Byredo candle for more than half the price). Last but absolutely not least is Maison Louis Marie No. 4 Bois de Balincourt. I think this has become my favorite candle, almost overnight. If you have ever smelled Le Labo's Santal 33, which is perhaps one of the most recognizable scents at the moment, then you will know exactly what this smells like. It's also half the price of the Le Labo option. I think that this scent is best suited for Autumn and Winter because it is very woodsy and almost leathery smelling. It is $34, but I think it is absolutely worth it because of how sophisticated and complex the fragrance it.